We were just friends, at first. I met my hubby Eric about 3 years ago at a church munch and mingle. We both liked Mystery Science Theater 3000, huzzah! I didn’t like him THAT way, though (more like didn’t realize, but we’ll get to that,) so nothing came of it. I moved away for a couple months, then came back. Someday I want a really fancy Zelda costume. I rigged this up myself..it’s decent. We started doing activities together with another friend. Eric and I would talk about the people we liked and give each other advice on what to do. Ha! It was casual and fun, and we began to be closer as the months went on. I loved how he would go on walks with me. I had a Wii (I’ve been playing video games since the 1980s – started on Intellivision) and Eric offered to buy The Legend of Zelda: Twilight Princess if we could play together, which we did. It was fun to switch off turns and help each other out. And then….it all changed one week. We kissed, and I discovered that I did like him THAT way, so we started dating. 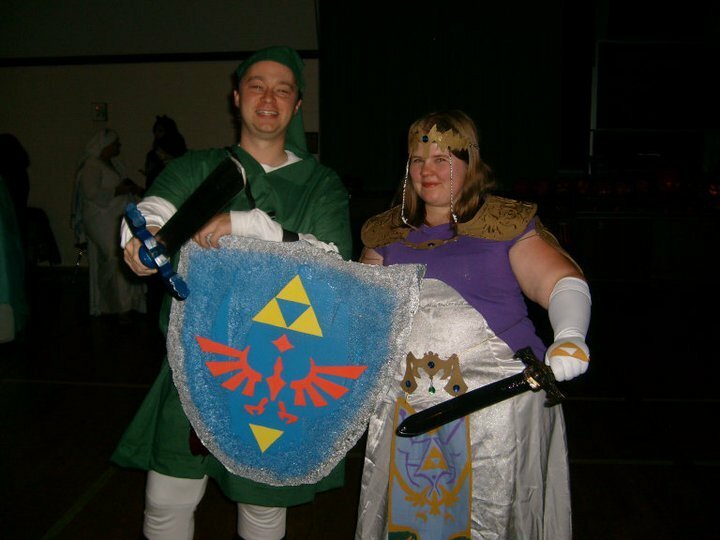 We were Link and Zelda for Halloween. Everything was bliss. I couldn’t believe that this was finally happening to me. On February 13th of that year, he proposed on the beach at sunset with a sapphire and diamond ring. It was absolutely perfect for this Southern California born girl. I said yes and we were married just under 4 months later. It was a lovely backyard reception with a luau theme. He surprised me with a serenade of “Crazy Little Thing Called Love” by Queen. Come join us for our wacky adventures and follow the story of 2 Dorks in Love. We like geekifying our family and yours by sharing craft tutorials, recipes for geeky foods and lots of other nerdy merriments. Cute idea, and I love the graphics! Put a bird on it!